On the evening of the 29th, Grand Duke Jean, Hereditary Grand Duke Guillaume, and Hereditary Grand Duchess Stéphanie attended the 12th tribute concert to honor Grand Duchess Joséphine-Charlotte. 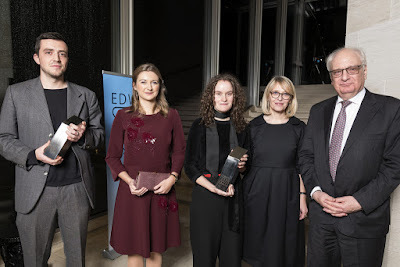 The event, held at Philharmonie Luxembourg (with the Etablissement public Salle de Concerts Grande-Duchesse Joséphine-Charlotte), featured the Orchester des Champs Elysées under the direction of Philippe Herreweghe. Pianist Kristian Bezuidenhout also played in the performances that highlighted music by Beethoven. On the 29th, Grand Duchess Maria Teresa attended an academic session to honor the 30th anniversary of the Association Luxembourg Alzheimer (ALA). 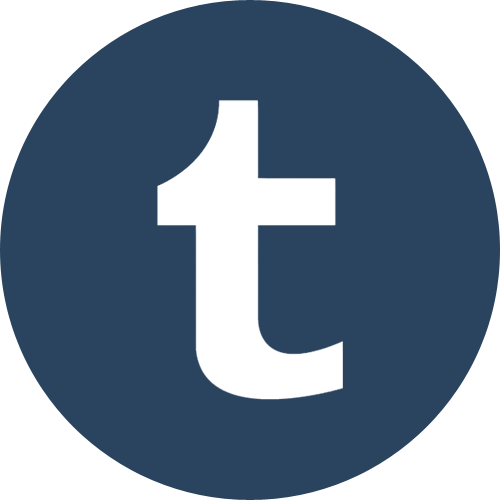 She has been a patron of the organization since 1991. A little more information from the Cour website. 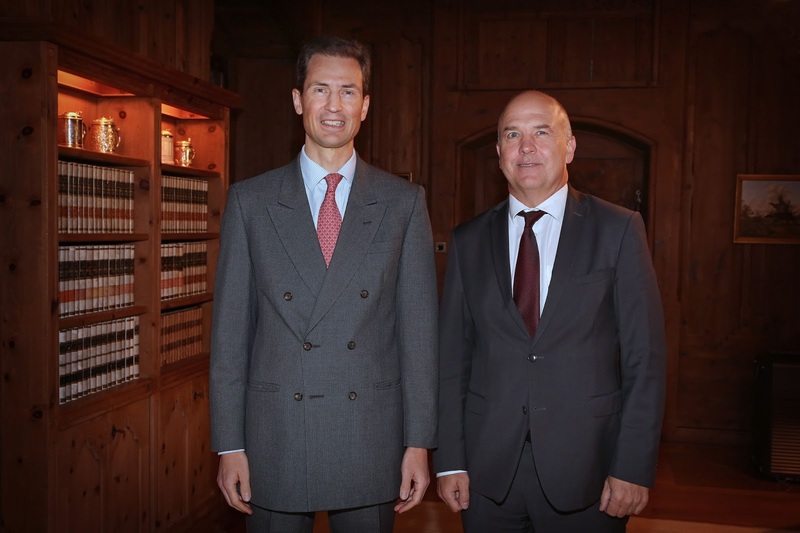 Hereditary Prince Alois has given an interview to Swiss TV about all kinds of things relating to the Liechtenstein and its western neighbour, Switzerland, including the relations between the two nations, Liechtenstein's surprisingly diverse economy and the Princely Family's and the Principality's history. The full interview in German can be seen here. So turns out Princess Alexandra on a state visit is pretty much a royal recycling fest - and that brings us to our 11th edition of Royal Recycling and Clothes Sharing courtesy of this week's trip to Japan. 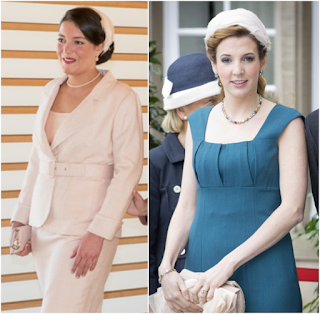 Mind you, Princess Alexandra is an old pro when it comes to rummaging through her relatives' wardrobes so it doesn't come as the biggest of surprises that we saw a few repeats. And yes, I like to imagine it something along these lines. First day, first appearance, first hat previously worn by another family member - check. 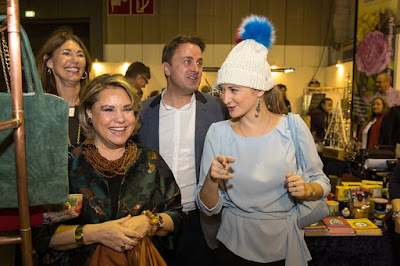 From the get-go Princess Alexandra showed her commitment to the Grand Ducal Family's love of sharing the love by sporting a white feathered headpiece previously worn by Princess Tessy for National Day 2013. 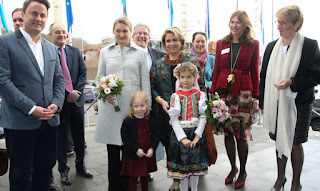 Princess Alexandra's third outfit of the first day brought us another clothes sharing moment when she brought out a bolero style jacket previously worn by the Grand Duchess on a number of occasions including the 60th birthday party of King Carl XVI Gustaf of Sweden in 2006. 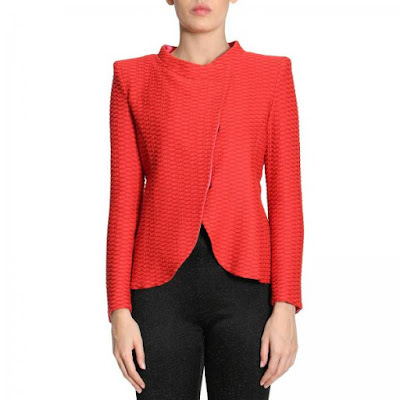 Got to admit though that I much prefer the jacket with a black dress. Somehow it ended up looking like an afterthought to Princess Alexandra's stunning red gown. 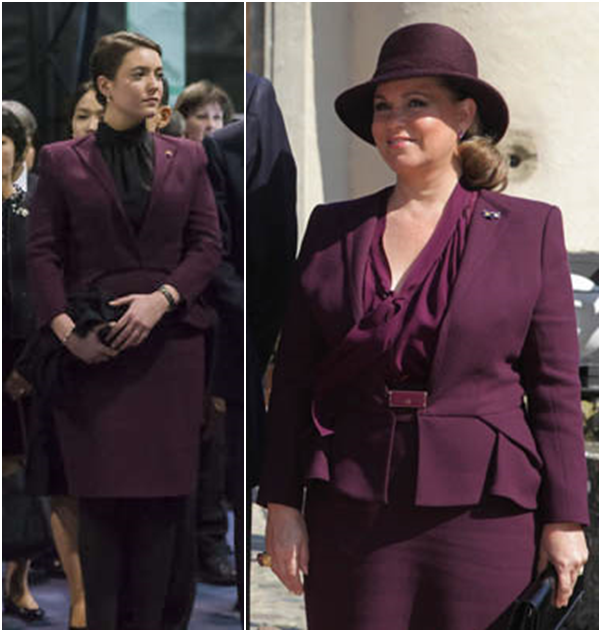 This one though... Va-va-woom, girl is rocking this Elie Saab number previously worn by Grand Duchess Maria Teresa for the state visit by then Queen Beatrix of the Netherlands to Luxembourg in 2012. 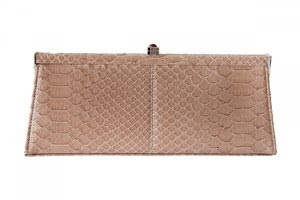 Frankly, I much prefer Alexandra's styling and hope that this goodie will stay in her wardrobe for a long time to come! 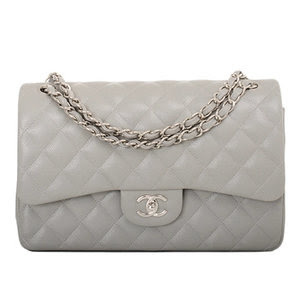 Fun fact: It is actually one of the outfits our very own fashion expert Heaven wished to see again in our Royal Recycling and Clothes Sharing Wish List - dreams do come true after all. 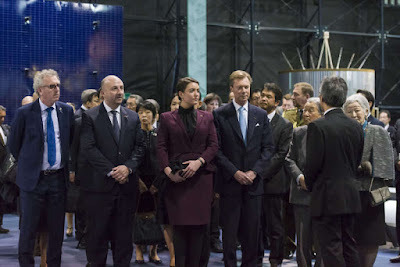 Stay tuned with possibly more clothes sharing love to come tomorrow, which is sadly already the last day of the Luxembourgish state visit to Japan! 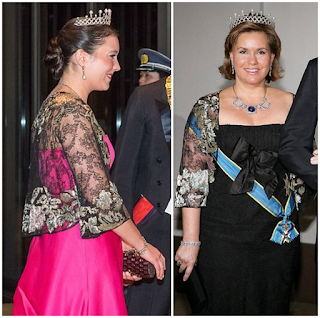 In the meantime, also check out our previous editions of Royal Recycling and Clothes Sharing. 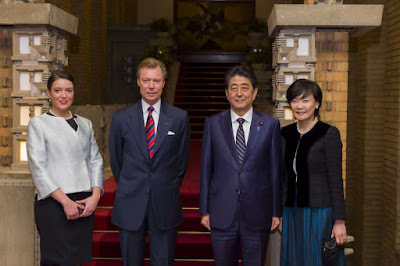 Grand Duke Henri and Princess Alexandra are currently in Japan for an official three day visit - and it looks like the grand ducal couple's only daughter is taking to the state visiting business like a fish to water. 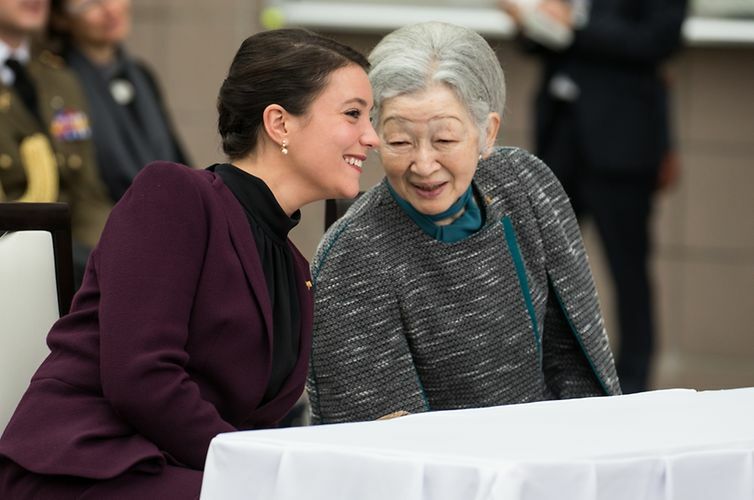 She and Empress Michiko seem to be having a blast at their joined events. Moreover, Princess Alexandra is also a pro at the whole royal recycling thing, as proven by yet another clothes sharing moment today. I'm inclined to petition to have Alexandra show up at all the state visits in the future. 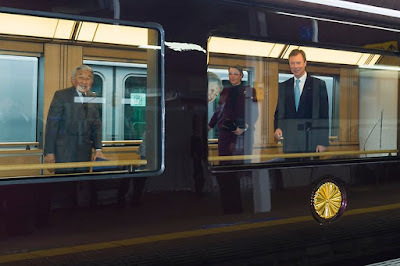 On the second day of the visit, the Luxembourgish guests and their hosts, Emperor Akihito and Empress Michiko, hopped on not any but the imperial train to head to the Ibaraki Prefecture where they visited the cities of Tsukuba and Tsuchiura. They were accompanied by the Minister of the Economy Etienne Schneider and the Minister of Finance Pierre Gramegna and cheerfully welcomed by the crowds. The Grand Duke and Princess Alexandra as well as the Emperor and Empress greeted the local population in place of the Town Hall in Tsuchiura, in the presence of Tsuchiura Municipal Assembly President Yaguchi Kiyoshi, and the Mayor of Tsuchiura City, Nakagawa Kiyoshi. They also saw a musical performance in their honour. Subsequently, the the Luxembourgish delegation and their hosts took part in a private luncheon. Afterwards the day's agenda continued with a visit to the Tsukuba Space Center of the Japan Aerospace Exploration Agency (JAXA). The official delegation was welcomed by Toshiei Mizuochi, Minister of State for Education, Culture, Sports, Science and Technology, by the Director General of the JAXA Research and Development Directorate, Ryouichi Imai, by Tsukuba Mayor Tatsuo Igarashi, and Tsukuba Municipal Assembly President Shiota Hisashi, in the presence of JAXA President Naoki Okumura. In the Space Dome showroom, Professor Kuninaka Hitoshi provided explanations for the Hayabusa spacecraft and the Hayabusa 2 return capsule with asteroid samples on board. 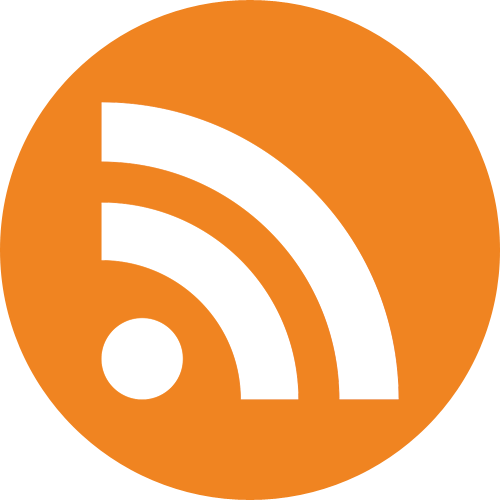 Information about the Japanese Experimental Kibo module of the International Space Station (ISS) was provided by Professor and Astronaut Wakata Koichi. After the return to Tokyo in the afternoon, the Grand Duke held an official meeting with Japanese Prime Minister Shinzo Abe. 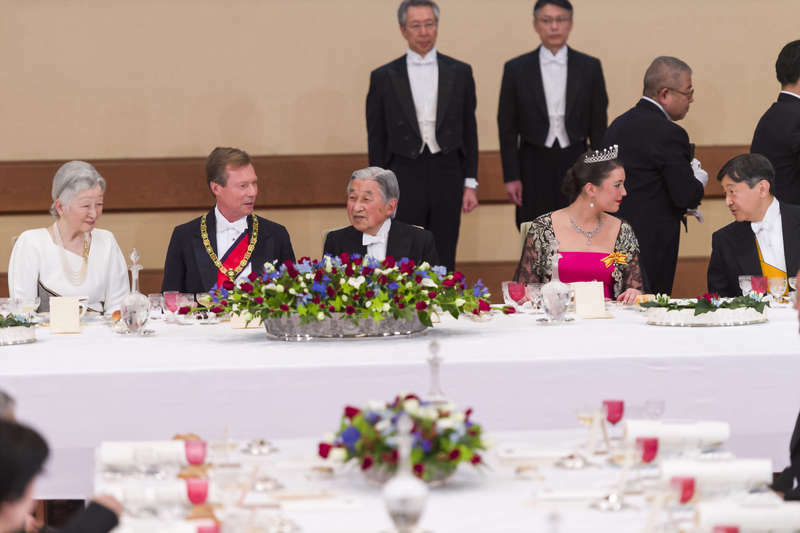 The day was rounded off with a dinner hosted by Prime Minister Abe in honour of the Grand Duke and also attended by Princess Alexandra. For more pictures of the day, check out the cour, the government, Tageblatt and Wort. 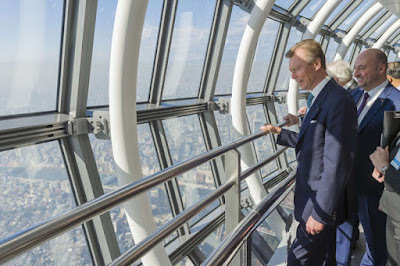 Earlier today, Grand Duke Henri arrived for a three day state visit in Japan. The Grand Duke is accompanied by his only daughter Princess Alexandra, whose mother pulled out of the visit due to her fear of flying. 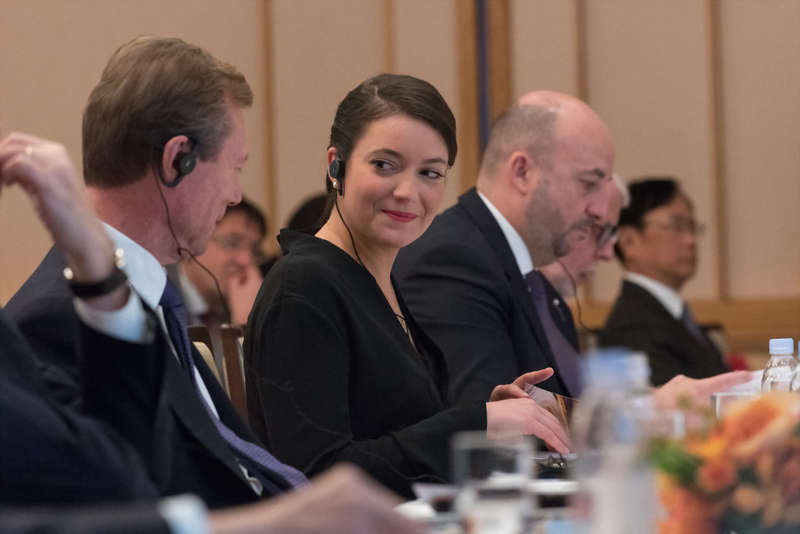 He is also joined by Deputy Prime Minister and Minister of Economy Etienne Schneider, Minister of Foreign Affairs Jean Asselborn and Minister of Finance Pierre Gramegna as well as an economic delegation of about 100 people for the visit to Tokyo and Tsukuba. After arriving to Japan, Grand Duke Henri and Princess Alexandra were officially welcomed by Emperor Akihito and Empress Michiko at the Imperial Palace in Tokyo. They also get the chance to greet the Crown Prince and Crown Princess as well as members of the government including Japanese Prime Minister Shinzo Abe. 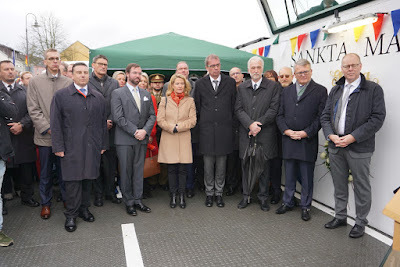 After military honours, national anthems, the review of the troops and the presentation of the respective delegations, the Grand Duke, his daughter and their hosts held private talks. 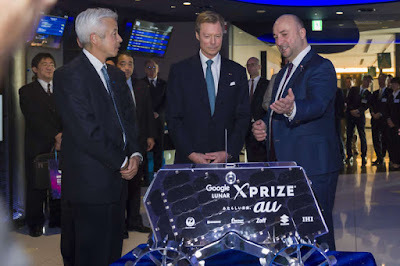 Subsequently, the Grand Duke and Princess Alexandra made their way to the Japan-Luxembourg Business Forum. 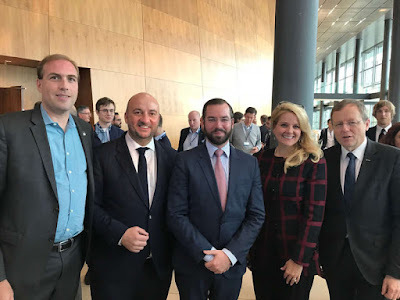 The seminar gave Luxembourgish companies the chance to establish contacts or deepen their relations with local companies in areas such as logistics, tourism and information technology. 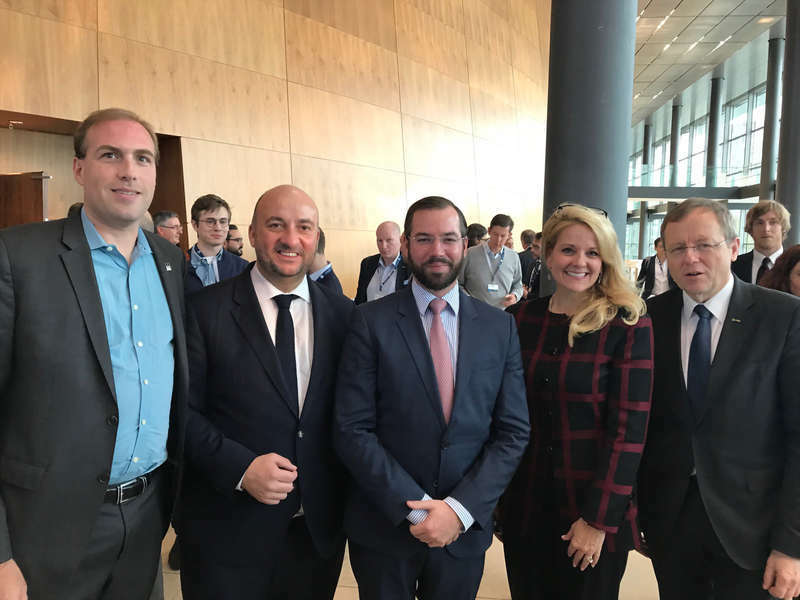 Grand Duke Henri gave the opening remarks of the Business Forum which included a presentation on "Luxembourg, the European country that never ceases to amaze you". At the end of the seminar, a memorandum of understanding was signed between the Vice-President of the Luxembourg's Chamber of Commerce and the President of the Japanese Chamber of Commerce and Industry and the Chamber of Commerce and Industry of the city of Tokyo. Next on the agenda was a visit to the Jesuit-run Sophia University. 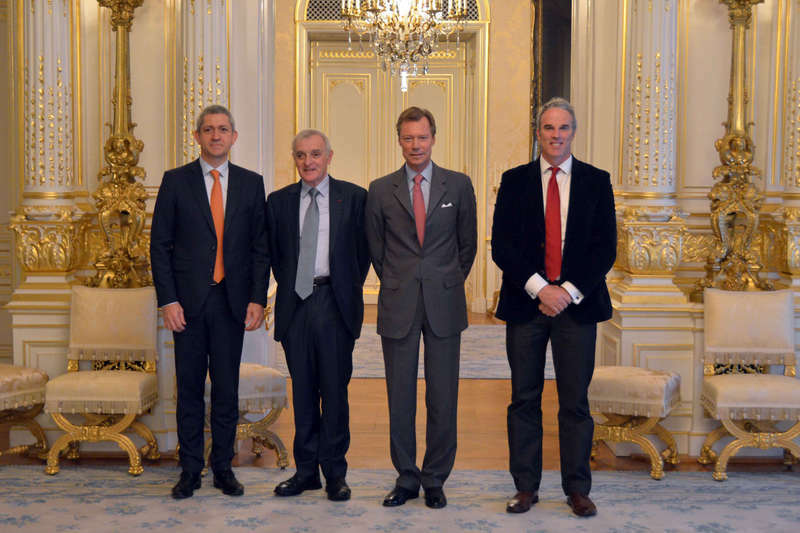 During the visit, the Grand Duke was awarded the title of Doctor Honoris Causa. 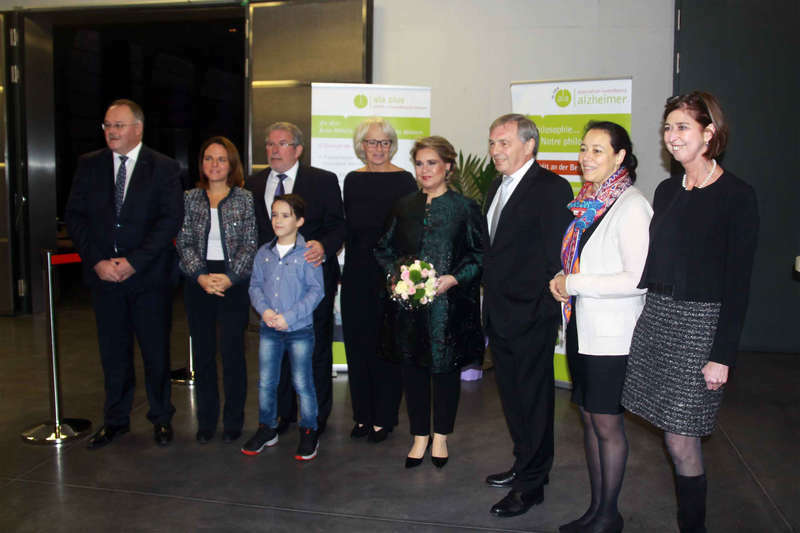 Luxembourg's Archbishop Jean-Claude Hollerich, a former professor and vice-rector of Sophie University, was also present for the occasion. 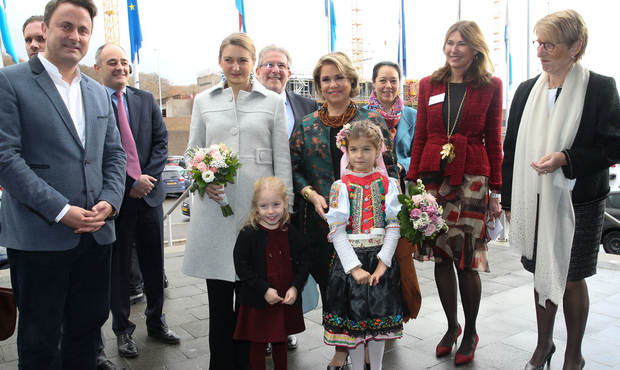 Grand Duke Henri and Princess Alexandra also met with local students. The day's programme was rounded off by the traditional white tie dinner in the evening. The Grand Duke looked his usual dashing self sporting the Supreme Order of the Chrysanthemum. Princess Alexandra wore a red gown with a bolero jacket previously worn by her mother and the Chaumet Diamond and Pearl Choker Tiara. She also looks to be wearing the necklace Grand Duchess Maria Teresa debuted during her silver wedding anniversary in 2006. 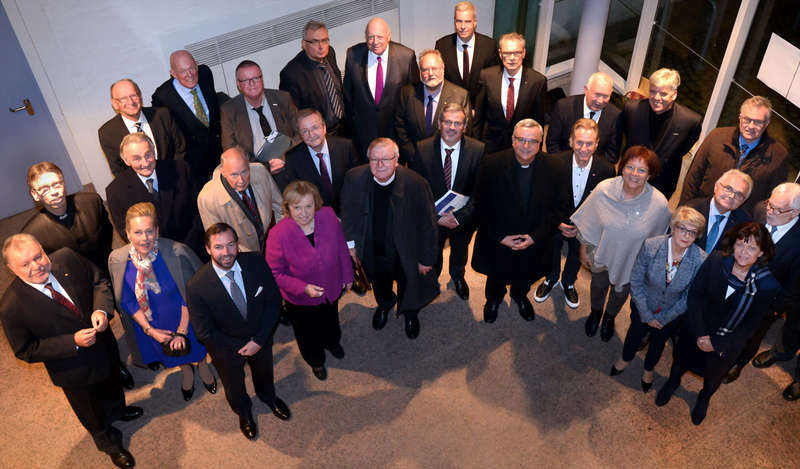 More photos of the day at the cour, the government, Wort and Tageblatt. RTL has a video, just skip ahead to the 28:50 mark, as does NHK. 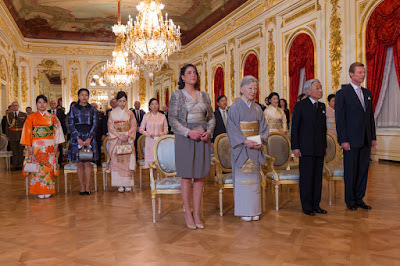 Otherwise stay tuned in the coming days for more of the Luxembourgish state visit to Japan marking 90 years of diplomatic relations between the nations. 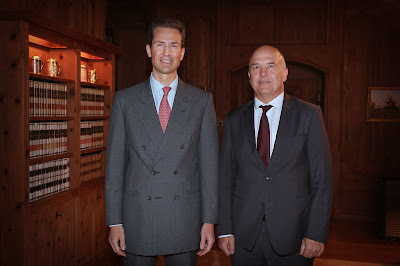 On Thursday, Hereditary Prince Alois received Nils Muižnieks at Schloss Vaduz. The Latvian-American human rights activist and political scientist has been serving as the Council of Europe's Commissioner for Human Rights since April 2012. 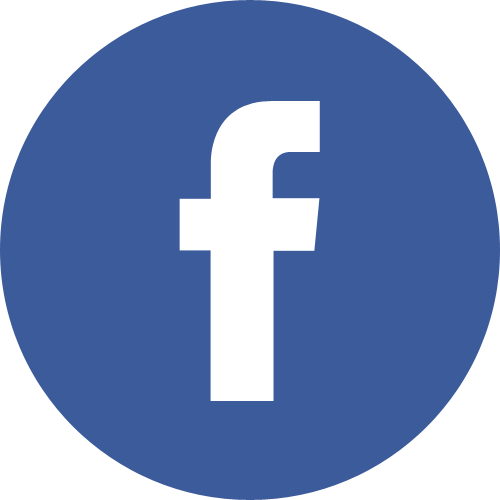 The Council of Europe, which compromises of 47 member states, is an international organisation whose stated aim is to uphold human rights, democracy, rule of law in Europe and promote European culture. Mr Muižnieks was on a working visit to Liechtenstein this past week. 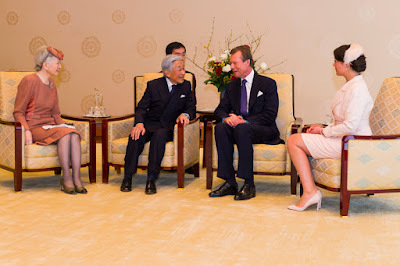 Next week the much anticipated Luxembourgish state visit to Japan is finally coming up. 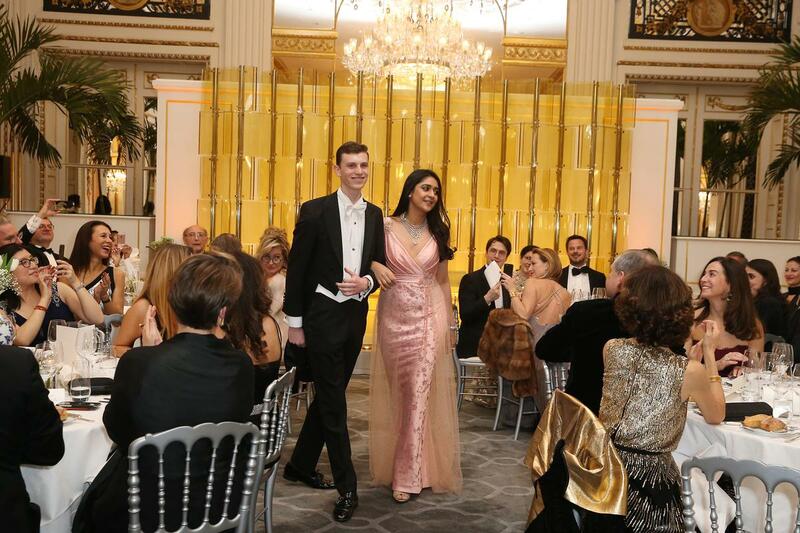 The Grand Duke will be joined by his only daughter Princess Alexandra. The Grand Duchess will not be travelling to Japan due to her fear of flying, the cour has announced. 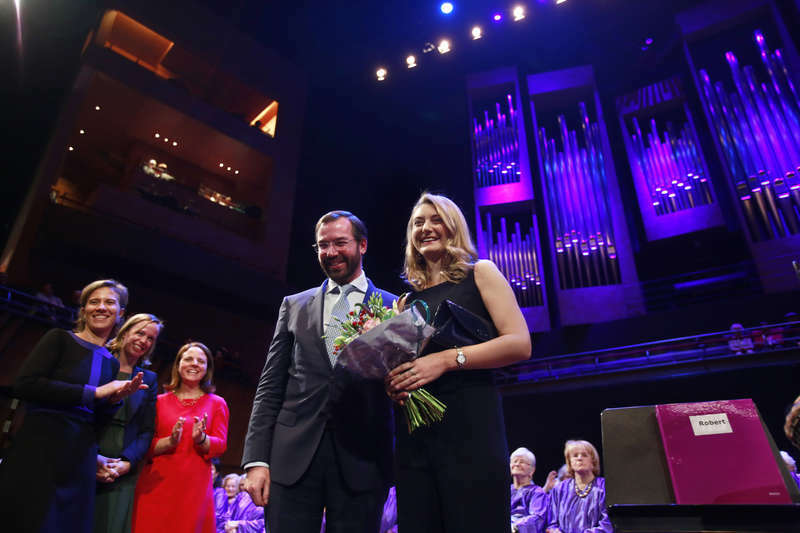 Some have asked why the Hereditary Grand Duke and Hereditary Grand Duchess aren't stepping in instead. 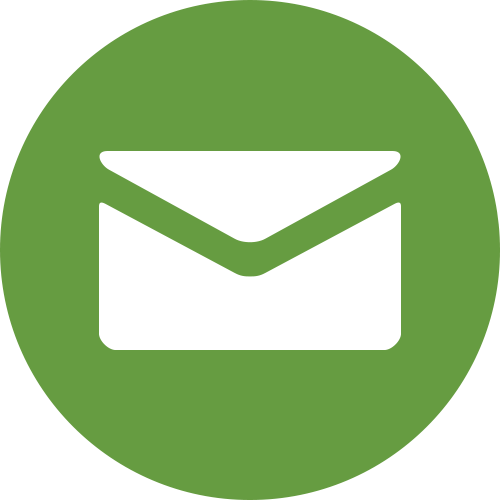 Two ideas: a) Prescheduled events or b) only a +1 was needed. Either way, yours truly it excited to see more of Princess Alexandra during a week than during some years. Grand Duke Henri and his daughter will presumably be leaving the Grand Duchy on Sunday to travel to the far east. The traditional farewell ceremony will take place at Findel Airport. 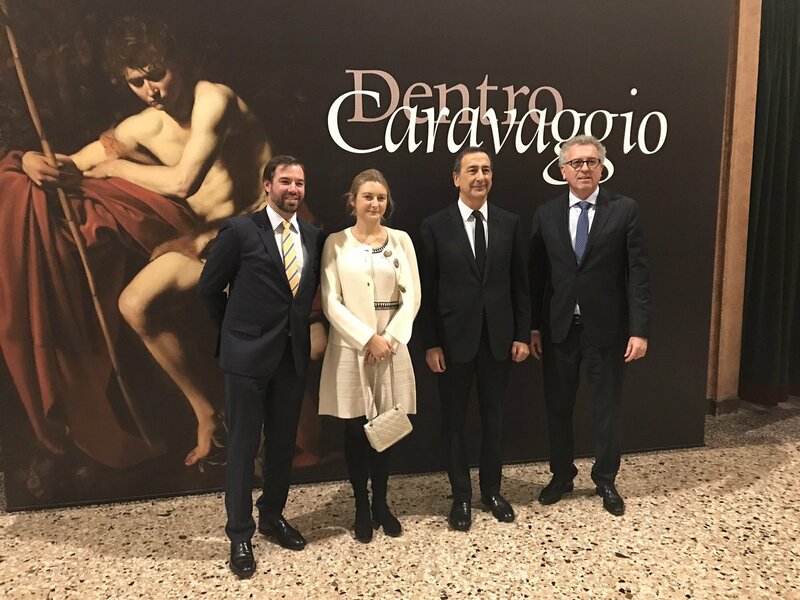 They will be accompanied by Deputy Prime Minister and Minister of Economy Etienne Schneider, Minister of Foreign Affairs Jean Asselborn and Minister of Finance Pierre Gramegna as well as an economic delegation of about 100 people. 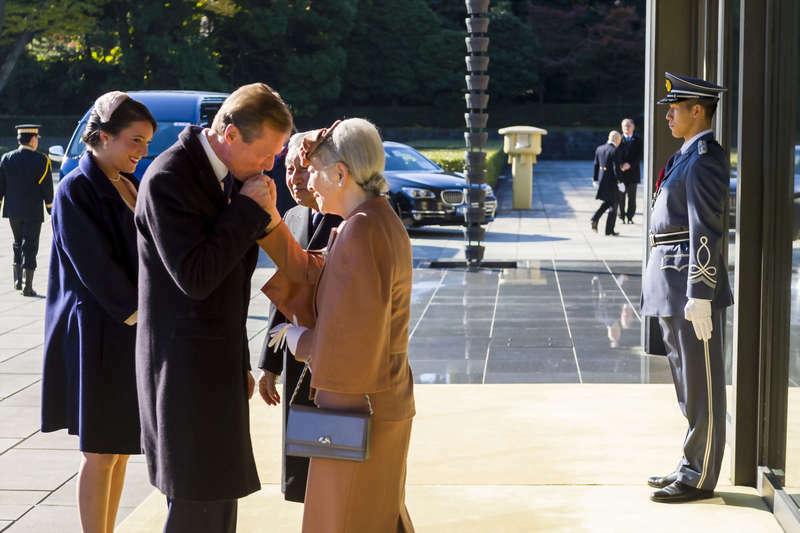 On Monday, November 27, the Grand Duke and Princess Alexandra will be officially welcomed by their hosts, the Emperor and Empress of Japan, at the Imperial Palace in Tokyo. Afterwards, Grand Duke Henri will deliver the opening remarks at the Japan-Luxembourg Business Forum. 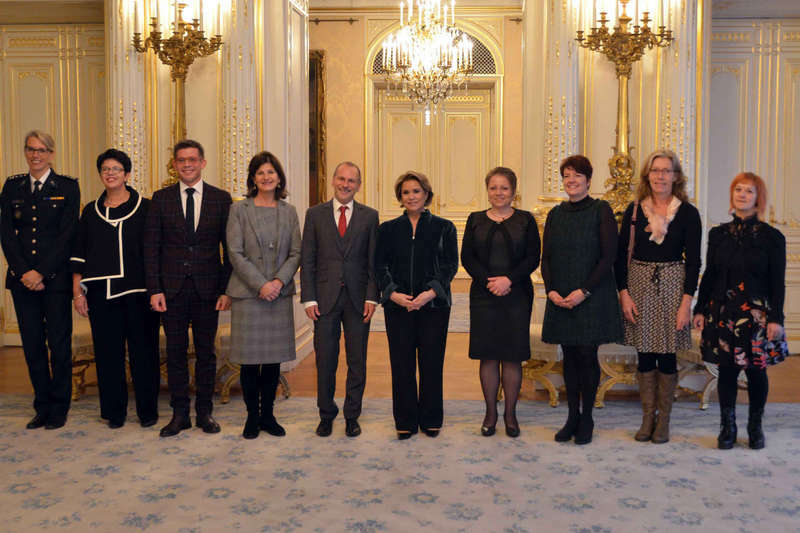 This seminar will give Luxembourgish companies the chance to establish contacts or deepen their relations with local companies in areas such as logistics, tourism and information technology. 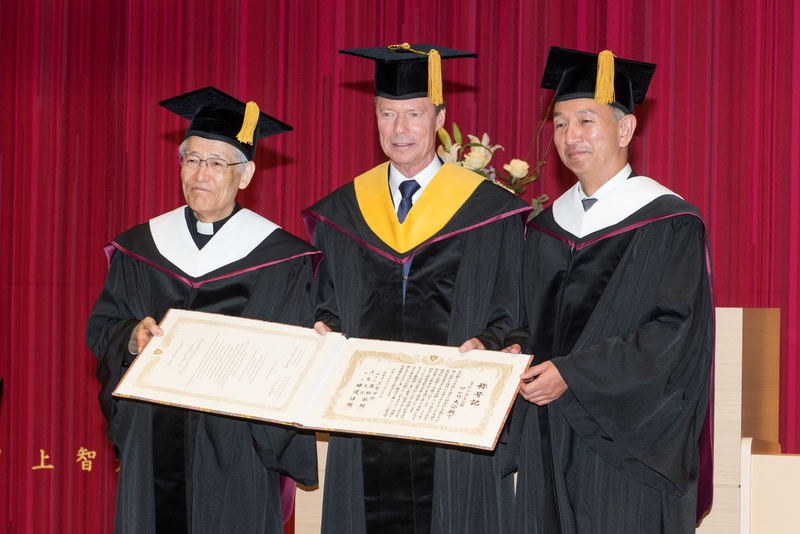 Subsequently, the Grand Duchy's head of state, accompanied by Princess Alexandra and Ministers Etienne Schneider and Pierre Gramegna, will be awarded the title of Doctor Honoris Causa at Sophia University. A meeting with students, professors and staff of Sophia University is also planned. You may recall the university from Prince Félix's and Princess Claire's visit to Japan a few years ago. There is also another connection to Luxembourg as the country's Archbishop Jean-Claude Hollerich is a former professor and vice-rector of the Jesuit university. 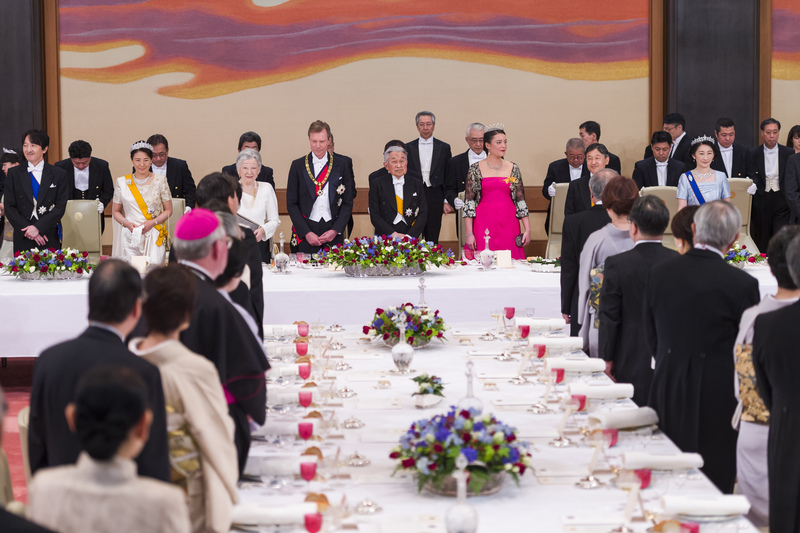 The first day of the state visit will conclude with the traditional gala dinner hosted by the Emperor and Empress in honour of their guests. Shallow me hopes for some major bling and a new - to her - tiara for Princess Alexandra. On Tuesday, Grand Duke Henri and Princess Alexandra, accompanied by Emperor Akihito and Empress Michiko, will travel to Tsukuba in the Ibaraki Prefecture with the imperial train, where they will be welcomed by the authorities and the local population. The delegation will then visit the Tsukuba Space Center of the Japan Aerospace Exploration Agency, in the presence of the Ministers of Education, Culture, Sports, Science and Technology. 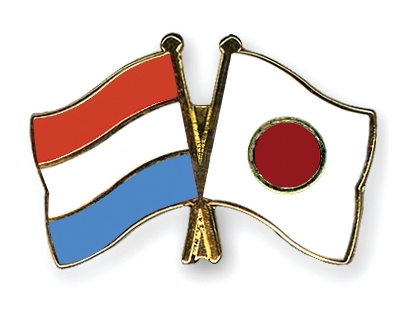 After the return to Tokyo in the afternoon, the Grand Duke will meet with Japanese Prime Minister Shinzo Abe. 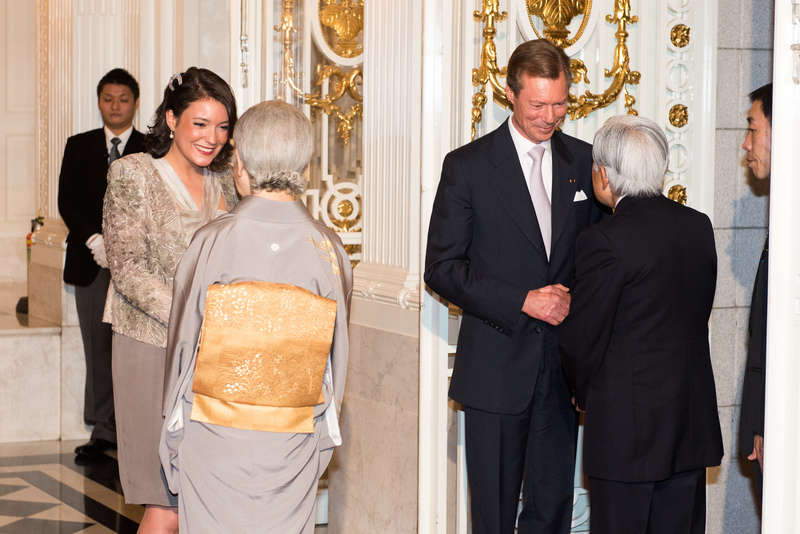 To round off the day, the return dinner for their Japanese hosts will be given by Grand Duke Henri. Princess Alexandra - and hopefully another tiara (a girl can dream!) 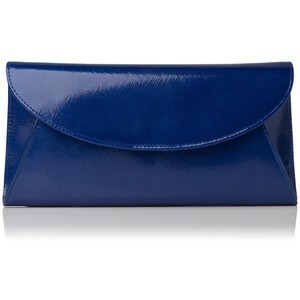 - will also be present for the event. Two conferences will be the main items on the agenda for day three of the state visit: The Luxembourg-Japan Space Conference and the Luxembourg-Japan Finance Conference. 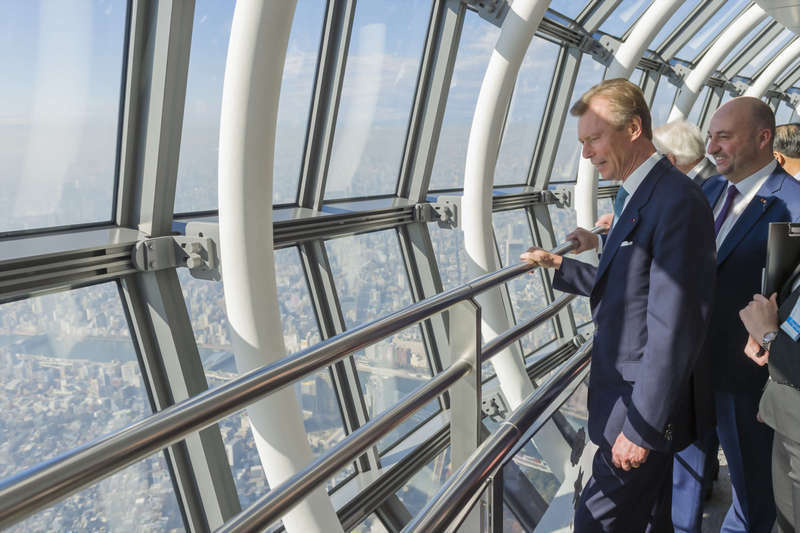 The first conference will also give Grand Duke Henri the chance to visit Japan's second tallest building. 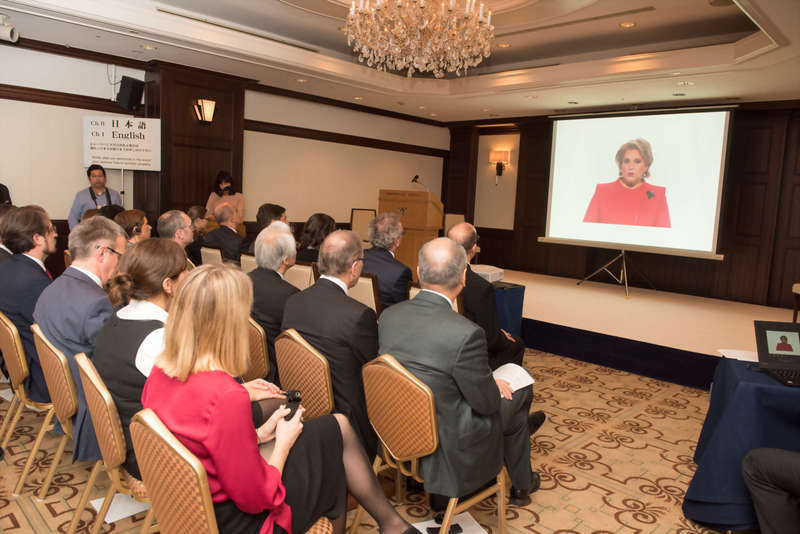 Grand Duchess Maria Teresa will offer the opening remarks of the second conference by video broadcast. 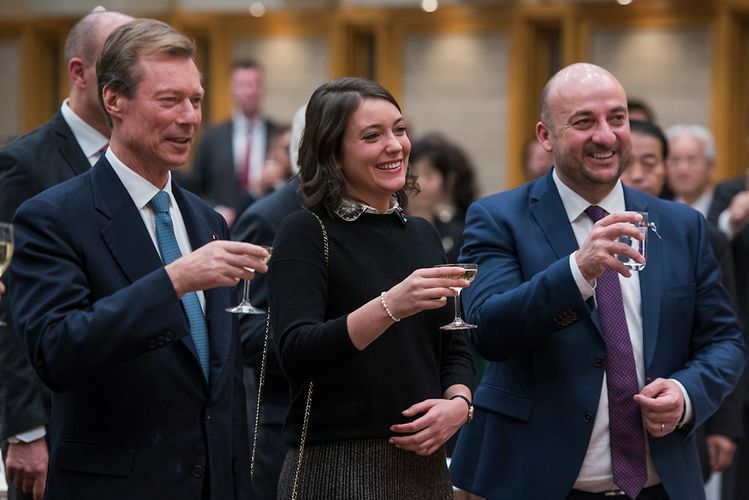 The state visit will end with a reception hosted by the Luxembourgish embassy in Japan and an official farewell by the Emperor and Empress. 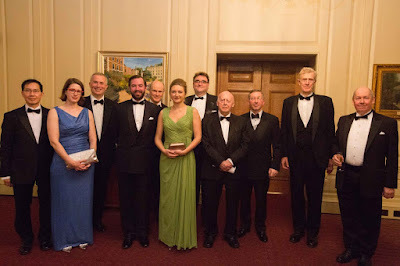 Yesterday, Prince Hans-Adam II attended a gathering by the Cambridge Union, a debating and free speech society in, you guessed it, Cambridge, United Kingdom. However, even with my mad googling skills I don't seem to be able to find out what he exactly spoke about though I'm guessing it is the state in the third millenium. 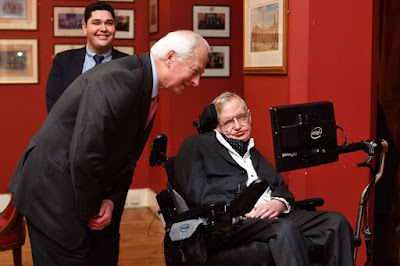 The Prince was also among the audience for an address by Professor Stephen Hawking two hours prior to his own speech. More pictures at Getty Images and The Cambridge Union's Facebook. 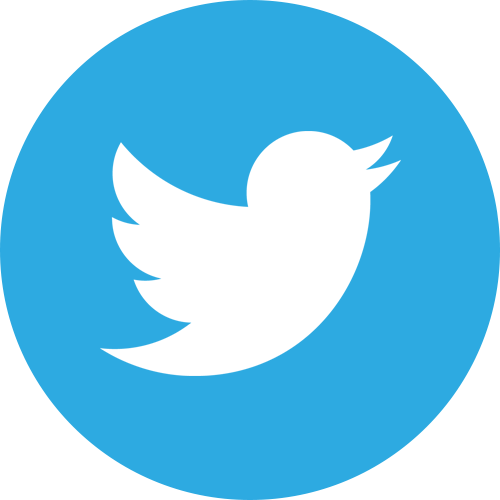 The event is held through the 17th and includes 25 heads of state in attendance. 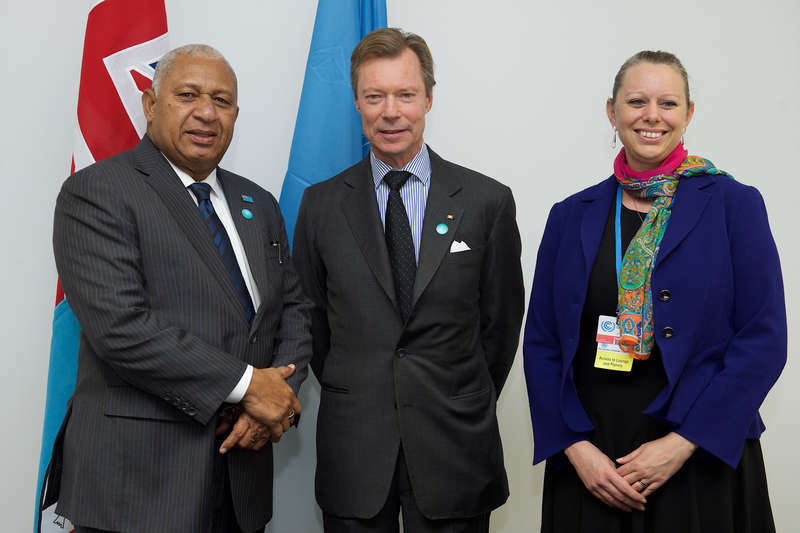 The five action areas for this meeting include "emissions, adaptation to the inevitable impacts of climate change, finance, partnerships and leadership." More photos of the Grand Duke, along with his speech, at the Cour website.